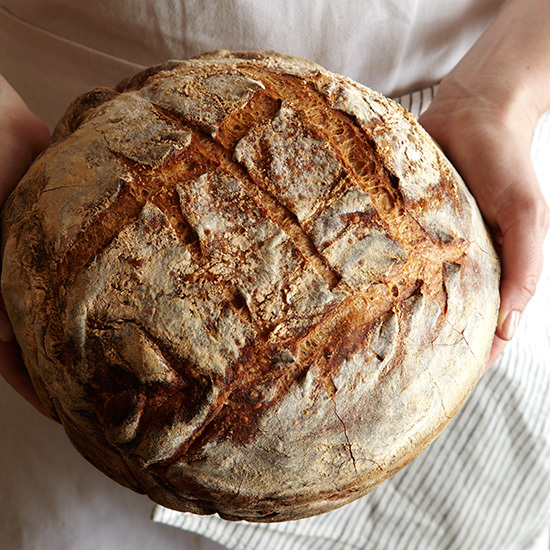 Tartine Bakery's Chad Robertson shares a simple way to make exquisitely flavorful and perfectly crusty bread without a sourdough starter. 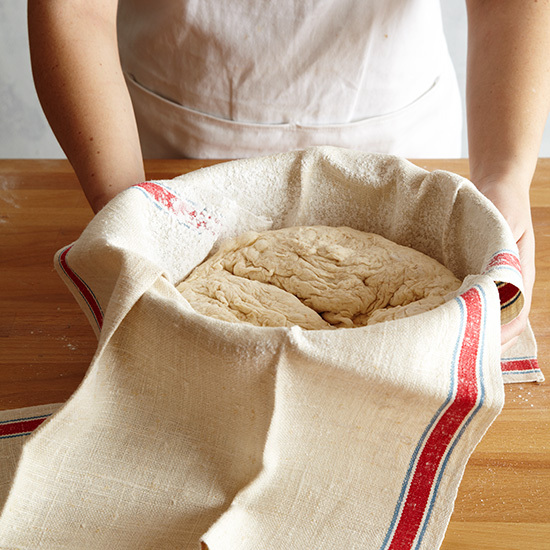 Instead of a starter, this recipe calls for a pre-ferment—a small portion of flour and water that is mixed with just a pinch of packaged yeast and left to ferment and develop flavor overnight. 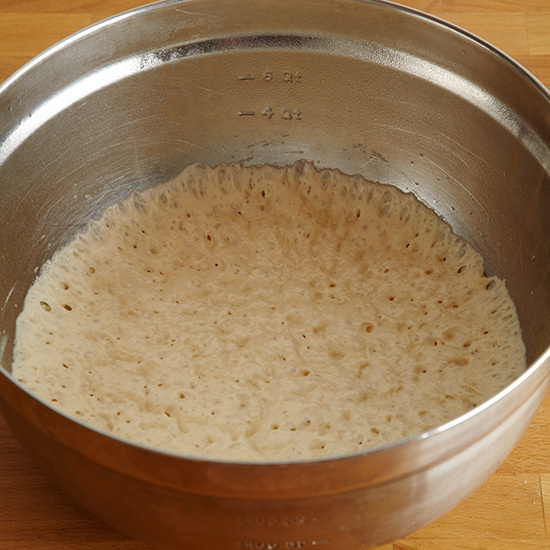 In a medium bowl, mix the water with the yeast. Stir in the flour. Cover loosely with plastic wrap. Let rise at room temperature for 10 to 14 hours. 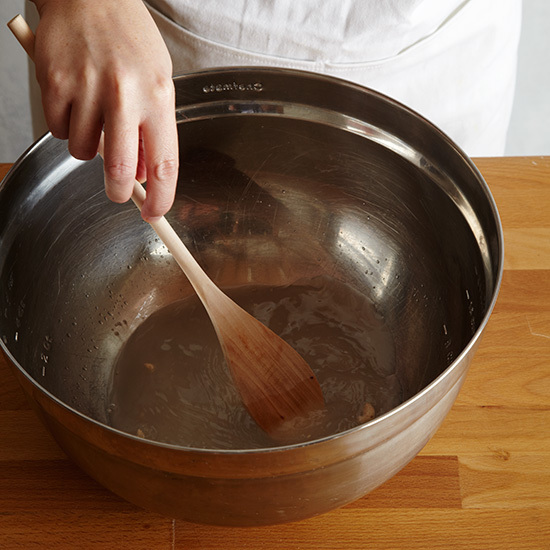 In a bowl, combine the warm water with the pre-ferment: Using your hands, break up the pre-ferment until dissolved. 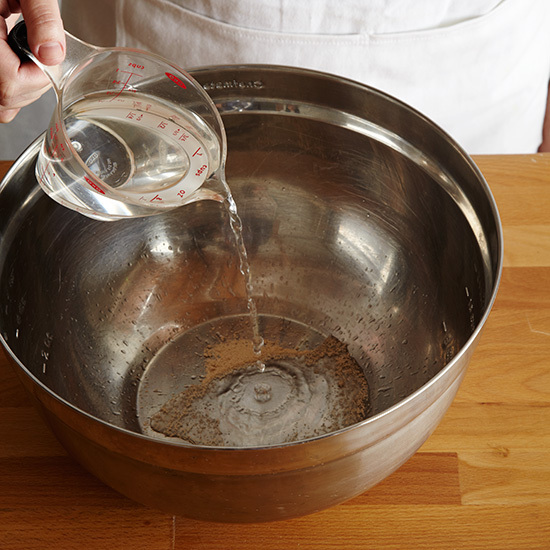 In a very large bowl, whisk the all-purpose flour with the whole-wheat flour. 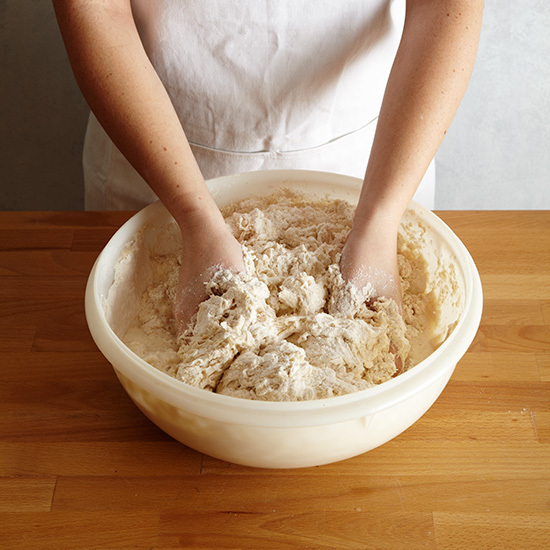 Using your hands, mix the dissolved pre-ferment into the flours. 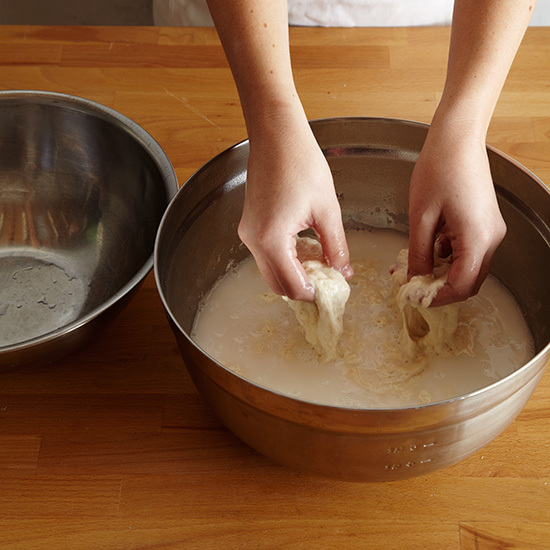 Continue mixing until a smooth dough forms. Cover the bowl with plastic wrap and let stand for 30 minutes. 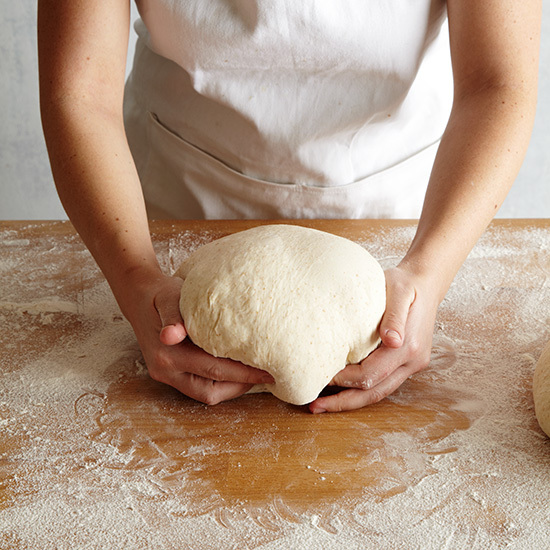 Uncover the dough and add the salt water. 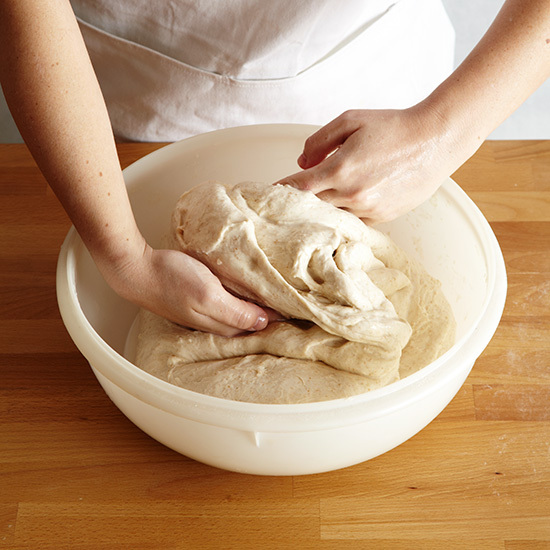 Gently fold the dough over onto itself until the salt water is thoroughly incorporated. 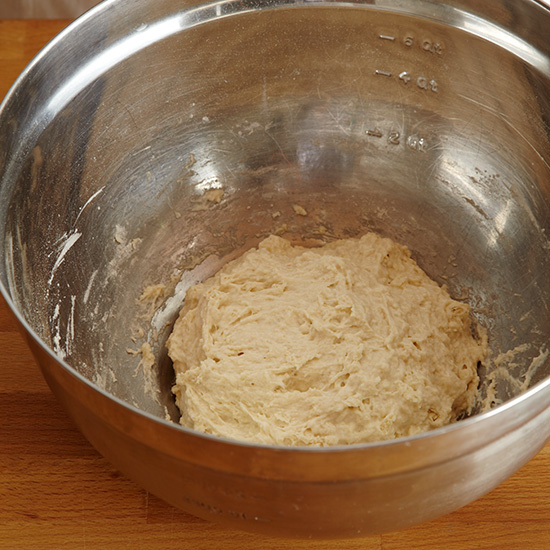 Loosely cover the dough and let rest for 1 hour; every 20 minutes, gently fold the dough up and over onto itself 4 times. 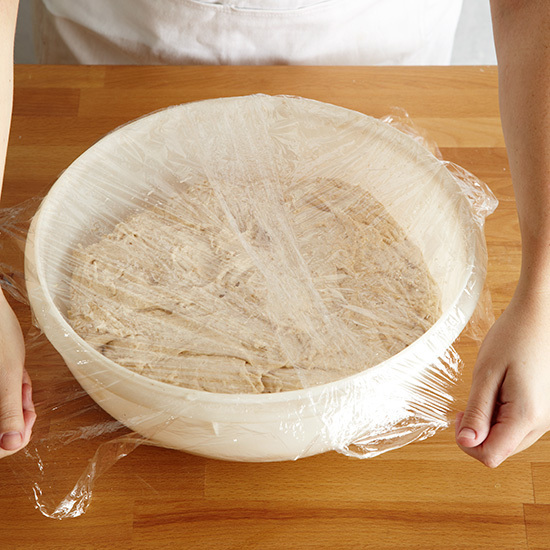 Cover the dough and let stand for 3 to 4 hours. 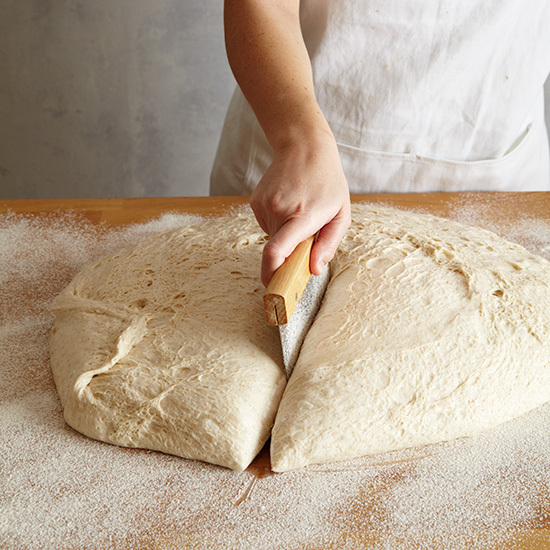 Turn the dough out onto a floured work surface and cut it in half. 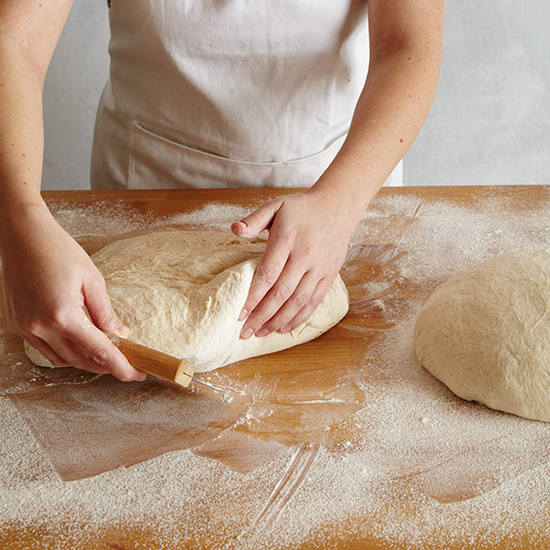 Using a bench scraper and floured hands, gently shape the dough into 2 rounds, folding the dough under itself as necessary. 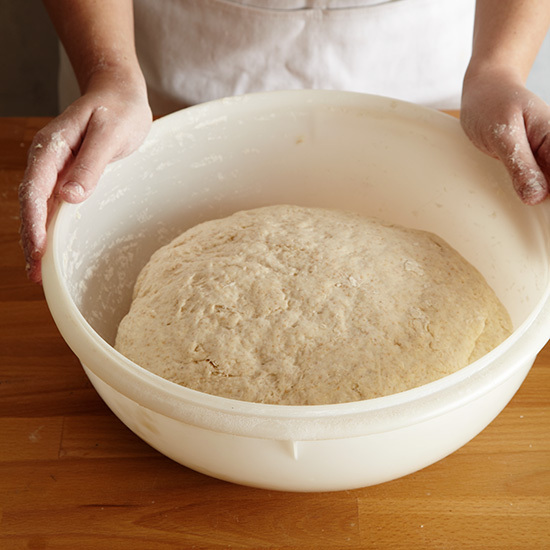 Let the loaves stand on the work surface for 20 minutes and then gently fold the sides under again. Line 2 large bowls with kitchen towels and generously dust the towels with rice flour. Transfer the loaves to the bowls, rounded sides down. 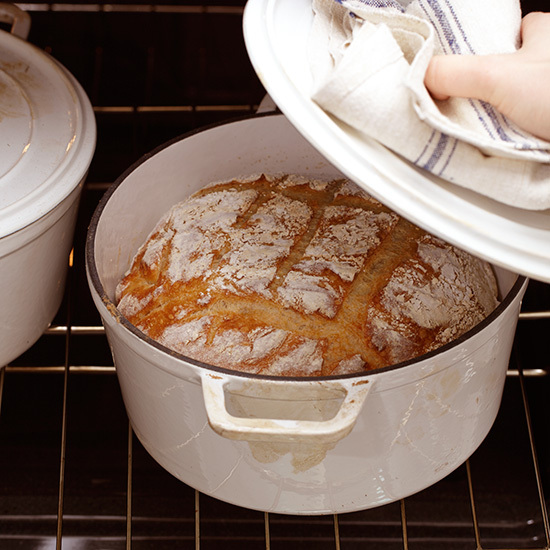 Cover the loaves with clean towels and let rise for 4 to 5 hours. Alternatively, let the dough rise for 1 hour at room temperature, then refrigerate the loaves overnight. 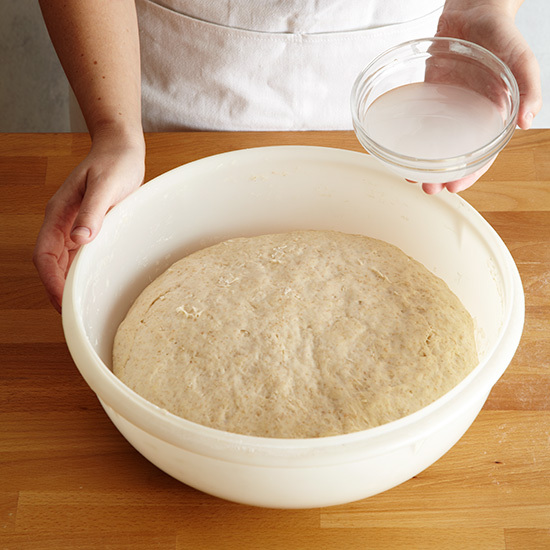 Let the dough come to room temperature before baking. 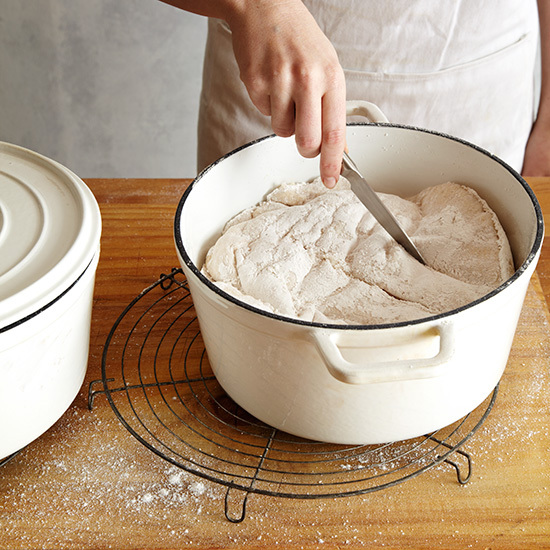 Heat 2 large enameled cast-iron casseroles or cast-iron skillets with lids for 30 minutes. Remove from the oven and dust the bottoms with rice flour. 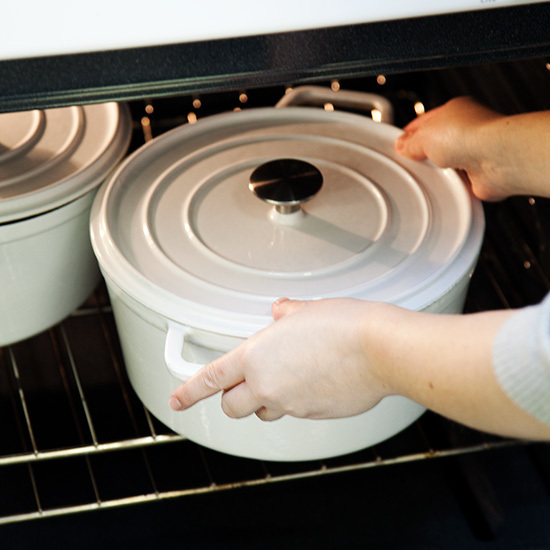 Turn the loaves into the casseroles, rounded side up. Score the tops with a sharp, thin knife. 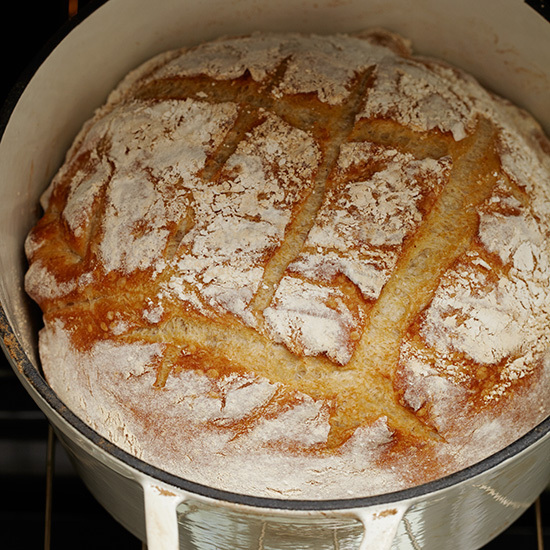 Cover the casseroles and bake the bread for 15 minutes at 490°. Reduce the oven temperature to 470° and bake for 20 minutes. 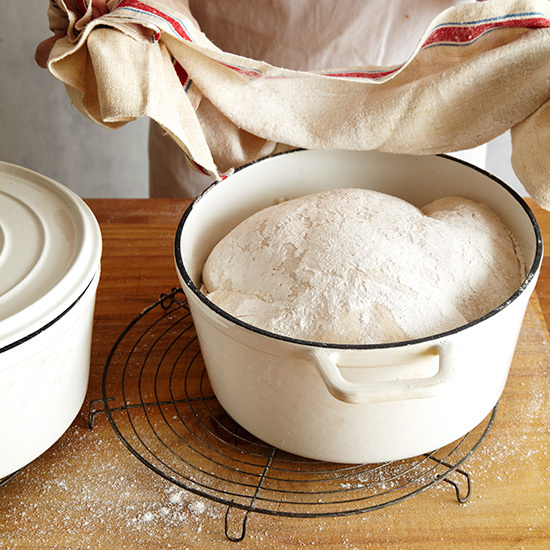 Uncover and bake the loaves for 25 minutes or until the bread is richly browned. 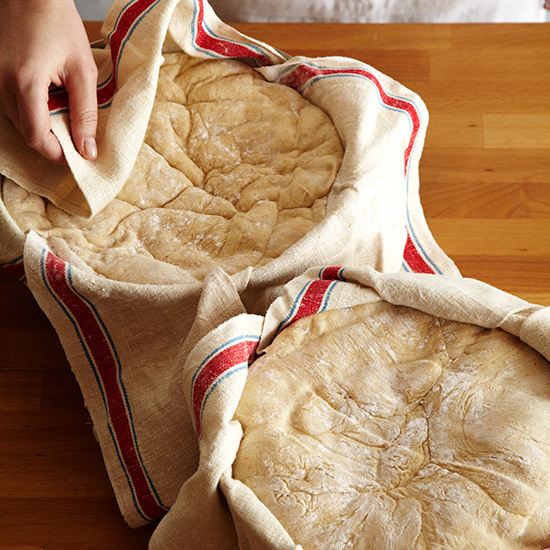 Transfer the bread to a rack; let cool before slicing.